It seems like only yesterday that I was standing by a volcanic crater near Landmannalauger in Iceland trying to photograph the surrounding hills. Exquisite shapes, textures and vivid colours in the soil that left me speechless. But there was a catch – strong winds made it extremely hard to even stand up, let alone do some hand-held photography. Roll forward twelve months and there I stood once again, at the Land of Plenty, with that incredible view before me, joined by a group of photographers as part of my Iceland photo tour. This time, however, the elements were all in our favour and the experience was even more magical; hardly any wind, very little rain and countless hours of photographing the incredible landscapes. So, with the many, albeit beautiful, images of this country that we have already seen, has Iceland been ‘done to death’? Certainly not! In my opinion we have only just started to scratch the surface of what this unique and enchanting country has to offer. In LPM this month we bring you an article by Marc Adamus, one of the most recognised landscape photographers in USA today, if not the entire world. 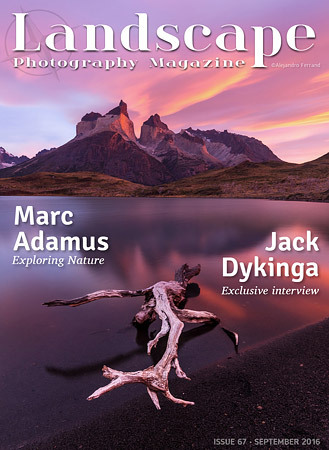 You can read Marc’s thoughts on all things landscape photography on page 68. We are also pleased to introduce our new monthly columnist, Alister Benn, a photographer with a unique style and a quite incredible journey in recent years. Our September interview is Jack Dykinga, Pulitzer prize winner and one of the most prolific landscape photographers today. Jack talks to Tiffany Reed Briley about his award, his lung transplant, the importance of having your own style and authenticity in the art of photography. Hudson Henry has compiled a small list of tips, suggestions and advice to help you get the most out of your trip to photographing Patagonia. Alain Briot talks about the importance of photo projects and the things we should consider doing in order to stand out amongst the crowd. Misty forests hold the potential to create evocative, unique and intimate images. Trevor Anderson shares advice on photographing misty scenes. Alister Benn argues that photography can form a facade to the world and that this impression is something you should think about when shooting. Rafael Rojas has released a new eBook on post-processing. David Hay reviews it here and examines if this is an essential read that everyone should refer to? Interview with landscape and outdoor photographer Rick Sammon from USA. This interview is sponsored by Really Right Stuff. Andrea Gulickx’s pictures have a fairy tale look and feel. In this article she explains how she creates such extraordinary images.